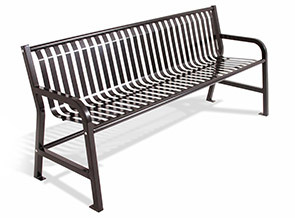 Spruce up a variety of public spaces with the sleek, economical Jackson Series all-steel park bench. This strong, powder-coated park bench is designed with a modern one-piece, vertically slatted seat that is supported by a 1-1/2"O.D. square bolt thru frame. Featuring 4', 6' and 8' lengths, the quaint and comfortable Jackson Series Park Bench conveniently allows guests to sit back, relax and enjoy the atmosphere.